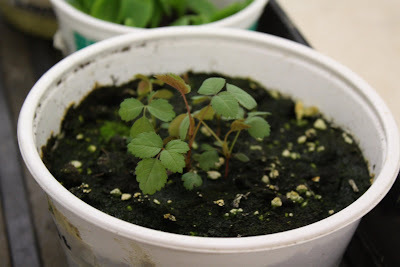 Here's part two of my little tutorial on starting seedlings... 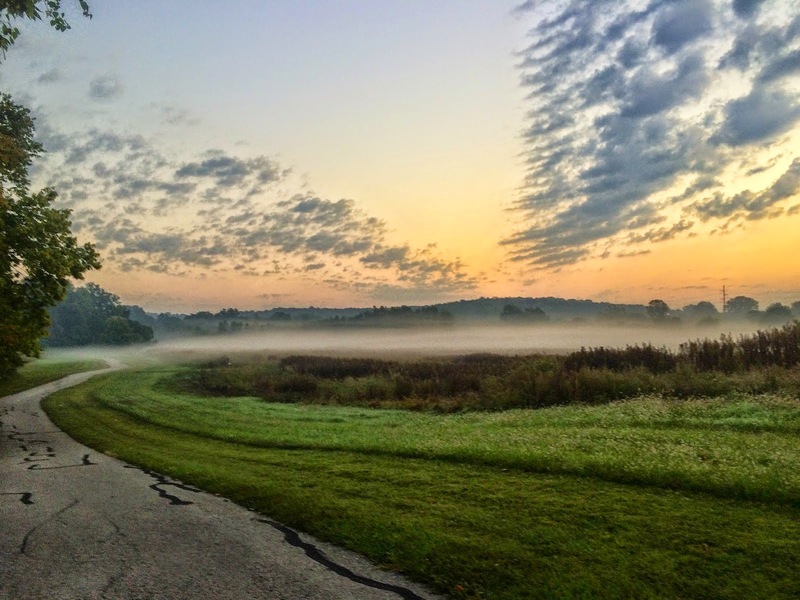 If you missed part one, you can find it here. Check your plastic wrap covered containers daily~ it's so fun to look for the green of new life there! 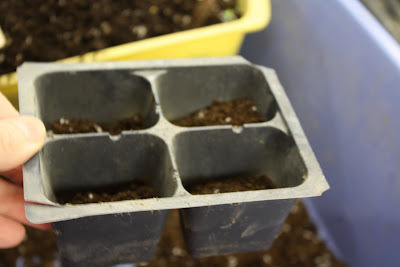 The plastic does a great job of keeping the moisture in, but if the seeds take more than a few days to sprout, you will need to lift the plastic and mist the containers to keep the soil damp. Once you see the little seedlings begin to sprout, call your children so they can see too and do a happy dance! 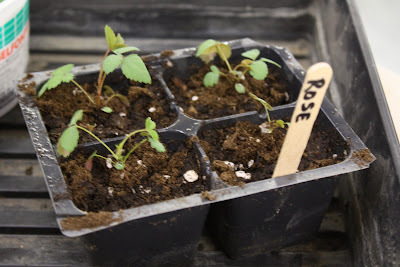 These little rose seedlings are ready for transplanting. Yep, rose seedlings! I purchased the seeds from Park Seed and had great success with them. I am not sure how they will preform in the garden here (we have very hot humid summers here, so many roses don't do well without a lot of coddling, which I simply don't have time for), but for pennies a plant, they should be a fun experiment! 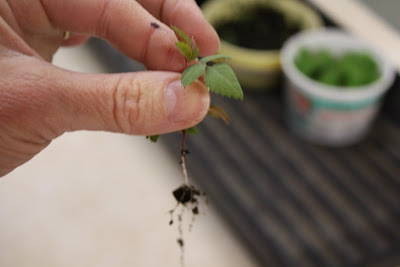 I like to use a popsicle stick to gently loosen the soil around each seedling and then remove it, being careful to retain as many of the roots as possible. then I place the new seedling in and fill in around it with seed starting mix, gently firming the soil. Most plants should be planted at the same depth that they were growing when you removed them. One exception would be tomatoes... I always pinch off the lower leaves and bury them up to the lowest remaining leaves. New roots will grow along the buried stem, giving you a very healthy and bushy tomato plant. Here are my little rose seedlings in their new home. I give them a gentle dose of water and then place them back under the lights on my seed starting shelves to continue growing until the weather is more settled here. 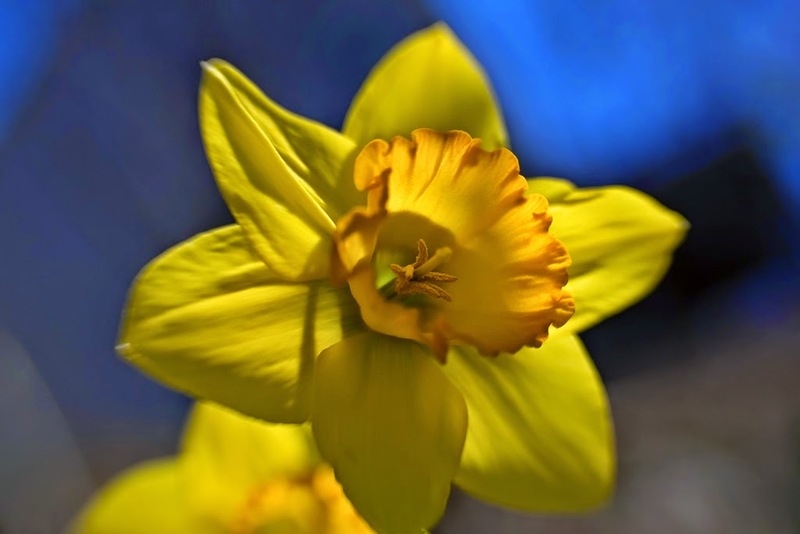 About one or two weeks before our frost-free date I will begin "hardening them off," by taking them outside to a sheltered area for several hours a day, gradually increasing the time that they are outside until it is time to transplant them to the garden. This really is not difficult to do~ is super-fun to do either by yourself or even more delightful with children and can save you a tremendous amount of money as well. Hope this was helpful for you. Please feel free to post a "comment" below if you have any additional questions or comments. I'd love to hear what you think!